Claudia Amos passed away peacefully at her home in Kelowna on August 30, 2018. Born alongside her twin sister Carolyn in a small farmhouse in New Glasgow, Nova Scotia on April 1, 1939, weighing 1.5 and two-pounds. The doctor said she wouldn’t live, boy was he wrong. Pre-deceased by her parents Chestly and Mary Teed, siblings Greta, Louis, James, Alex, Eileen, Howard, and her twin Carolyn, Claudia leaves behind her children Jeff (Kathleen) Amos, Carolyn Amos and grandchildren Zoe and Sam Carlyle and Evan Amos. Also mourning her loss are her “bonus” daughter/best friend Susan Abel-Lapointe and her “bonus” granddaughter Sydney/little dumpling Lewis, and, of course, Finnegan her treasured fur-baby. Prior to moving to Kelowna, Claudia spent many years in Edmonton raising her children. Always the entrepreneur, she kept her passions alive through a driving range, a curling shop, and a clothing store. A master story and joke teller, Claudia constantly kept people laughing. Known for her love of fashion and all things fabulous, especially leather and pearls. Claudia lived a life full of friends, family, and fun. 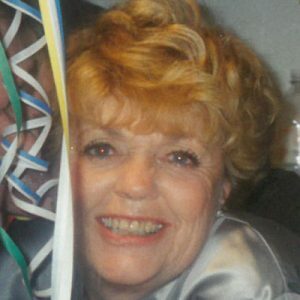 She loved many things including: golf; bridge; martinis; dinner parties; puppies; off-side jokes; dancing; curling; entertaining; country music; and, most of all, her family and friends. The family thanks Stella, Sidney, Bonnie, Lynda, Ghislaine, Shirley, Cheryl, Dorothy, Ellen and all the “Bridge Girls”. These marvelous women were Claudia’s dearly loved and treasured friends who were there for Claudia over the years through thick and thin, laughter, and tears. As per Claudia’s request there will be no funeral service. A celebration of life will take place at a later date. In the meantime, Claudia would love to know you were kicking back, pouring a glass of wine, listening to some Willy Nelson, and remembering the good times. In lieu of flowers donations may be made to the SPCA. The service for AMOS, Claudia is scheduled for A Celebration of Life will be held at a later date. . Below you will find the map for the service location and the contact information should you have any questions. We are so sorry to hear of Claudia’s passing. I can see she was an amazing woman, and much of what is written is so dearly reflected in Carolyn. My deepest sympathy to Claudia’s immediate family, Caroline, Jeff & Kathleen along with her precious grandchildren. I personally know how much Claudia’s Bonus daughter/best friend, Susan & Bonus Little Dumpling grand daughter Sydney, will deeply miss her too. Sharing great memories of our loved ones when they pass is a wonderful celebration of their life on earth & keeps them close in our hearts. I have memories of Claudia that will always make me smile. Claudia and Stella were best buddies. That is how I met her. She was a fun loving, giving, caring person. Wish there more like her. RiP lovely lady. Moms are very important and special people in all our lives. I am sorry for the loss of such an amazing person in your life. Our thoughts are with you, Zoe and Sam at this time.